As the only Halotherapy center in the Kansas City area, Kansas City Salt Mine offers three options for clients to choose from. We invite you to learn more about the different rooms by reading below, and please contact us if you have any questions about our services. All Salt Rooms are wheel chair accessible. When calling to schedule your appointment please let us know if you need wheel chair accessibility and we will do our best to accommodate your needs. What is the difference in the two salt rooms? 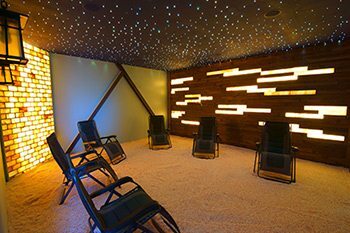 The Large Community Salt Room – Is a quiet, dim atmosphere where people come to meditate, rest and relax, so we ask you to refrain from talking while in this room. If you would like to chat or read, we do have another room designated for just that. 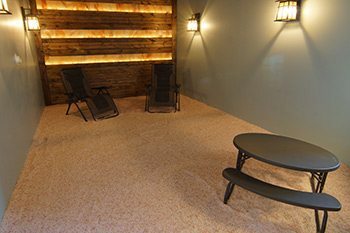 The Smaller Community Salt Room – Provides an atmosphere for chatting with friends, reading, catching up on paper work, or where children can play in the sand, read, color or play with toys. Adult supervision is required for all children between the ages of one and twelve. 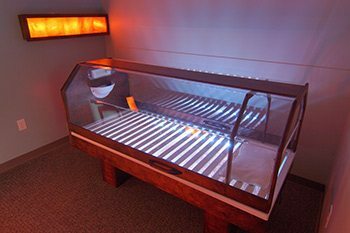 The Salt Bed Chamber – Our salt bed functions the same as our salt rooms, only on an individual level. For more information on the salt bed experience and what to expect click here. What to expect from a salt session? A typical salt session lasts approximately 45 minutes. You will be provided with clean socks upon entering the salt room, large throws are available for those who tend to get chilled. The therapy involves sitting in an adjustable and comfortable zero gravity lounge chair, the lights will dim and you will hear relaxing music. Most people lay back, close their eyes, sleep, meditate, listen to the music and just relax during the treatment. The room temperature and humidity is maintained at a comfortable level. A change in lighting or the stop of the fan will alert you when your session is over. Do not use any perfumes, lotions, or any substances that may produce a fragrance. Strong odors from perfumes as well as essential oils can interfere with the effectiveness of the session. We highly suggest all electronics, valuables and bags be left at home or in your vehicles. We will not be responsible for any damage the salt may cause to electronic devices. Clean socks will be provided and must be worn in the salt rooms at all times. Dress in simple, comfortable clothing. Children 12 and under must be in the presence of an adult / guardian at all times while in the salt room. The salt room is an extremely clean environment that requires responsible and respectful conduct at all times. Please ensure children use inside voices, as to not to disturb other sessions going on. PLEASE NO THROWING SALT and please no running. Your children’s safety is important to us. Relaxation and well being are just a call or click away. Call us today at 816-533-7014, or schedule an appointment by clicking here. Be good to yourself, find time to unplug, re-energize, catch your breath and appreciate yourself today!